Paradise 4 Paws is the premier resort for cats and dogs located near Chicago’s O’Hare and Midway Airports, at Denver International Airport, Dallas/Fort Worth International Airport with Boarding Lounge™ pick-up/drop-off service in central Denver and near Dallas Love Field. Our Chicago O’Hare resort was the first to open in May of 2008 and we have been expanding ever since. Paradise 4 Paws resorts provide superior quality and care for your pets and the utmost in convenience and service for you, the pet parent. We offer overnight suites for cats and dogs, doggie daycare, dog obedience training, grooming, massage therapy, a la carte services, and more! For our guests’ care and for your convenience, we are open all day every day – 24/7/365. At Paradise 4 Paws, our spacious, state-of-the-art environments are designed for superior cleanliness and comfort with the latest in pet hotel technology. 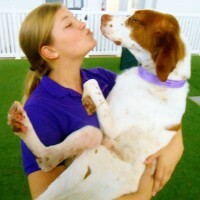 We provide crate-free boarding and do all that we can to ensure that every pet in our care is happy and healthy. I am head over heels in love with Paradise 4 Paws!! Our little dog is like our baby (and they totally get that here). We went in for a walk through before making our decision and couldn’t believe how detailed and attentive they were before we had even booked a reservation. I will absolutely use Paradise 4 Paws again. They say each dog is a VIP (very important pooch) and they really mean it. I don’t know what kind of customer service training/rubic is used at P4P but it should be adopted by all service businesses. From start to finish, their service was flawless. From start to finish, these guys plain ROCK. Making a reservation was a breeze and the staff is very helpful. Checking him in was easy as well, and you immediately get a feeling that your dog is in great hands. Perhaps one of the best features is you can park at their location and they will gladly drive you to and from the airport!